Principals of DMG Investments joined Cliffside Park Mayor Thomas Calabrese and other dignitaries to celebrate the opening of an on-site Sales Gallery at One Park, a new 204-unit luxury condominium building rising atop the Palisades in this Bergen County, N.J. borough. The completed Sales Gallery, which features interactive visual displays, a kitchen vignette with authentic finishes and appointments, and a model representation of the building, marks the launch of preview sales at One Park in advance of its official grand opening. 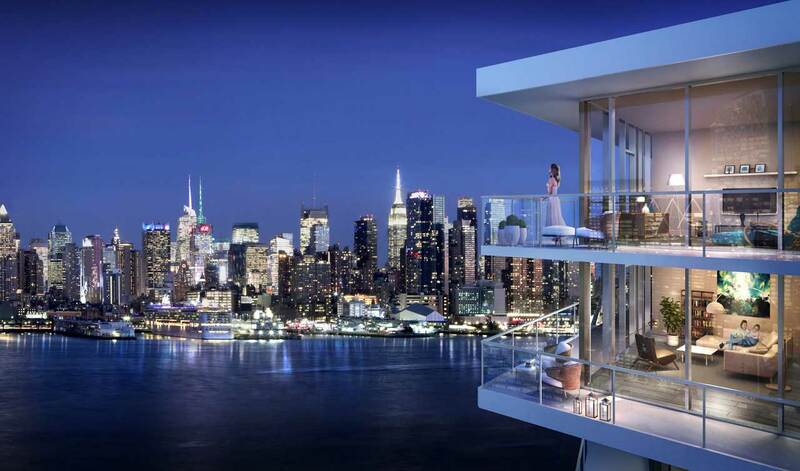 The dramatic space also reveals the building’s unimpeded Hudson River and Manhattan skyline views. “This is an exciting milestone for both our new luxury condominium building and the borough of Cliffside Park,” said Jacky He, Executive Vice President of DMG Investments, which is developing One Park and tapped Halstead Property Development Marketing (HPDM) as the building’s exclusive sales and marketing agent. Designed by noted architectural firm Architectura, the 14-story building boasts a glass curtain wall and private outdoor space for every home to take full advantage of its dramatic clifftop location and sweeping vistas. The distinctive new landmark offers a collection of one-, two-, three- and four-bedroom residences preview-priced from $500,000. Interior spaces curated by boutique design firm, VLDG Inc. feature spacious kitchens with chef-caliber appliances, the finest fixtures, and magnificent views. Bedroom suites are calm sanctuaries for rest and relaxation, with floor-to-ceiling windows flooding the space with light. Spa-inspired bathrooms are adorned with a freestanding sculpted tub, large open shower, porcelain flooring and richly-toned wall tiles. The dramatic elegance and sophistication of One Park are further enhanced by its more than 25,000 square feet of indoor and outdoor amenities. These will include a 24-hour attended front desk, an Aquatic Center featuring an indoor 55-foot heated pool with adjoining outdoor sun deck, sauna and steam rooms; and a private furnished roof deck including dining terrace with grilling stations, fire pits, intimate seating areas and outdoor movie theater. There’s also a state-of-the-art fitness center with private Pilates room and squash court, a golf simulator, children’s playroom, a pet spa, guest suites and a secure parking garage with a fully-automated Unitronics system.